We are engaged in manufacturing of premium quality Polyester Webbing Slings, which is made from quality material and using latest machines. Additionally, these Polyester Webbing Slings are well-acclaimed for their high strength and durability among the clients. Moreover, our clients can avail these slings in different lengths and different weight lifting capacities as per requirements of clients. We offer these products at highly competitive price in market. With immense experience and hard working personnel, we are offering a superior range of Polyester Webbing Slings. This range is procured from trustworthy vendors, who ensure to develop it utilizing superior grade raw material and advanced machinery. In addition to this, the offered range is applicable in different areas such as power plants, heavy machinery manufacturing unit, paper plants, building & constructions and military construction works. We are offering Web Sling. 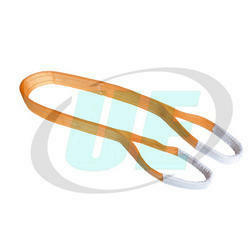 We are offering Webbing Sling. We are offering Flat Webbing Lifting Sling.